The original recipe called for butternut squash, but I used pumpkin. The pumpkins that I buy are always very orangey in colour. Which is why, I find the taste to be similar to butternut squash. I never knew that there was an obvious difference, not until Anne of Pigpigscorner told me during our meet up 2 years ago. No wonder my overseas readers gave me feedback regarding my pumpkin buns, that the dough was very sticky for them. The pumpkin there are far moister then here. Here, most pumpkins do taste like butternut squash and the flesh is orange in colour. Not yellow. And I saw some yellow fleshed ones (they were sold cut into halves or quarters) , bought some to taste, and indeed it isn’t as creamy and sweet as the orange fleshed ones, of which is so so similar to butternut squash. But then again… there is butternut squash, locally grown ones. There is no need to fork out huge amounts of money to buy Aussie grown ones. But you have to try your luck. Sometimes, not always, I do see them in the market and the market peddlers will just say they are long necked pumpkins. But they do know the long necked ones taste sweeter and creamier. So, if you could get the smooth long necked ones (of which is butternut squash), good, but if not any orange fleshed pumpkin will do. No yellow ones for this dish please. I made this for some elderly guests who came dining with us and everybody loved it, young and old. They even asked me for the recipe and requested I cook this for them the next time they come visiting again. I also made this dish for Reuben's 1st birthday party and almost all the ladies present (who cooks at home regularly) asked me for the recipe, or at least what did I put in because they want to cook this at home. They told me it's very nice and it's a nice break away from their usual method of cooking pumpkin. If you can, try to get this smooth skinned pumpkin from the market. The flesh is really thick and creamy! 1. Preheat oven to 180(fan)/200C. Line baking tray with aluminium foil. 2. 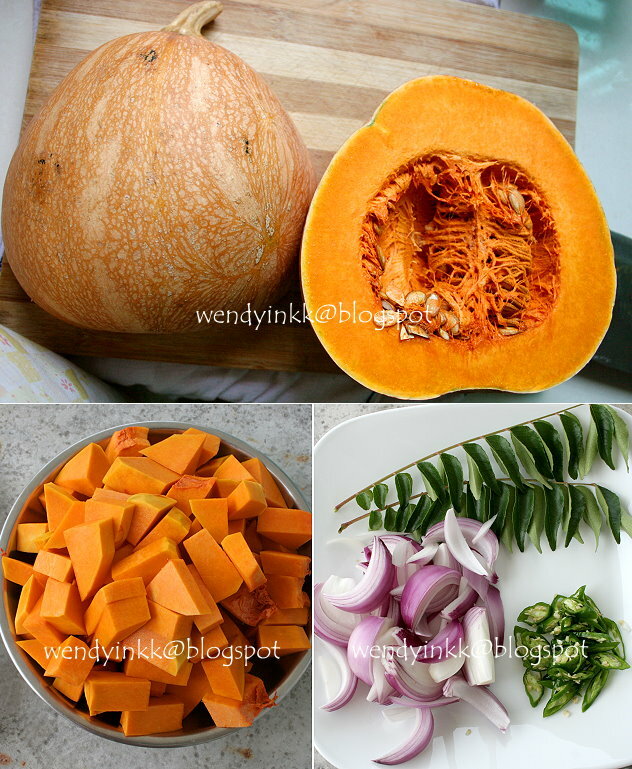 In a large bowl, put pumpkin and onion together. Put in 3 Tbsp of olive oil and toss. Pour these into the lined pan. 3. Bake for 15 minutes. Give it a light toss and bake it again for another 10 minutes until golden. 4. Meanwhile, prepare the spice mix. Mill the dried chilli, coriander, and cumin together until fine. 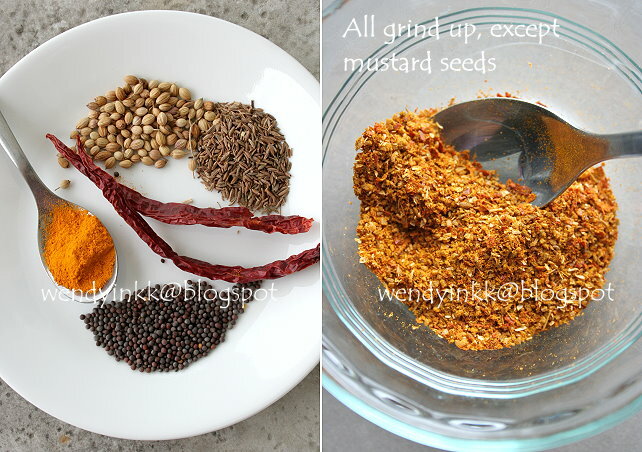 Mix with turmeric. Set aside. 5. 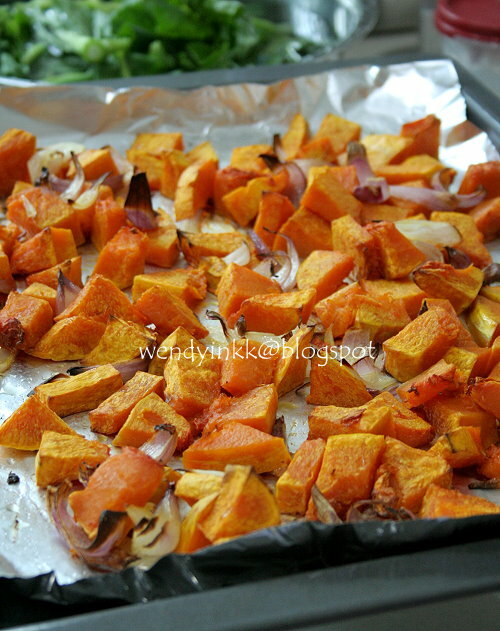 Remove baked pumpkin and toss the pumpkin to make sure it’s not sticking to the foil. Collect it in a pile in the foil. 6. Heat wok on medium low heat, put in 1 Tbsp of olive oil. Put in mustard seeds and cook it until it sputters. Put in sliced green chillies and curry leaves and cook until fragrant. Put in salt. 8. Garnish with some chopped coriander. 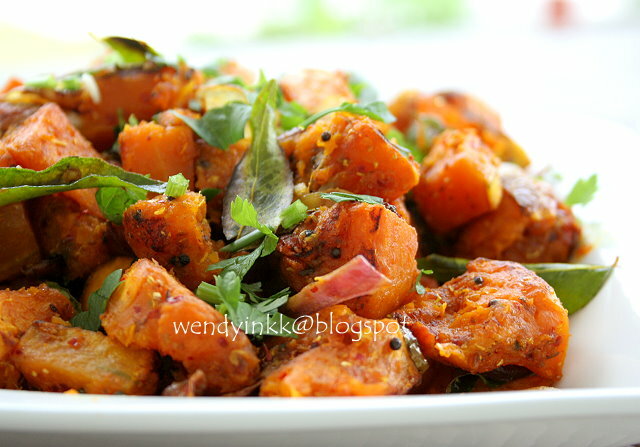 It sure taste delicious with baking, toss frying, and with all that spices and herbs in! This is a delicious dish! I will definitely cook this because I love pumpkins. Wendy, is there an easy way to peel pumpkin :)? This looks easy! I think I'm going to love this dish. Looks delish with all the herbs ! Thanks for sharing. Reminds me of something similar to what those indian.mamak restaurants serve sometimes. Very nice and middle eaterny. 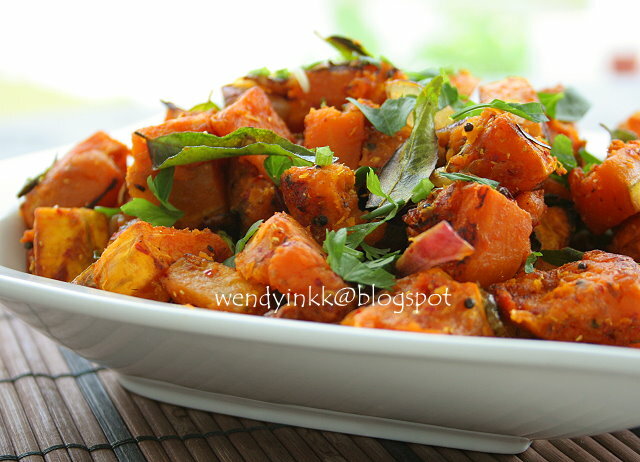 Hi Wendy, this is good on its own or even as lovely side dish for the main. Thanks for sharing. BTW, i made the rainbow jelly eggs yesterday with my kids and they love them so much. Thanks. This sounds good with all the spices and curry leaves used. I could have this as a snack! 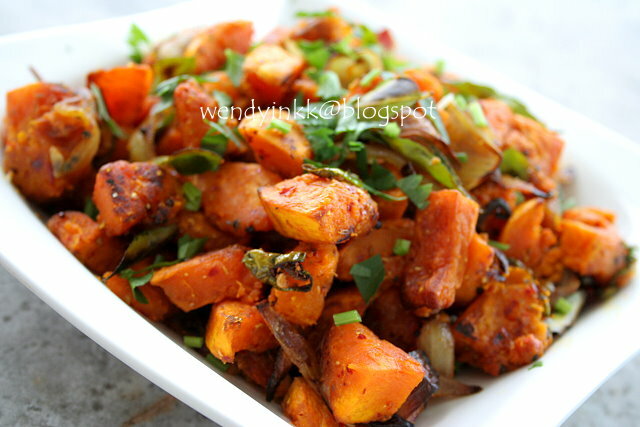 This pumpkin dish looks yummy with all the spices. Have never tried cooking pumpkin this way. i seldom eat pumpkin but this dish looks inviting for me. Oh Wendy, thanks for this recipe. Will cook it with our Christmas dinner. Something different! if you never mentioned, i didnt know the long neck ones are butternut squash. Next time must also stretch my neck and open my eyes and see..haha!